Copper-alloy disc brooch with relief decoration. Around the edge is a beaded rim with 28 or 29 small bosses. Inside this is a quadruped with all four legs shown, with the head facing backwards over the back and the tail bent forward to meet it. Each foot has three toes and the neck has zigzag edge representing a mane. The head has open jaws and a circular eye. On the reverse are two transverse lugs. One D-shaped one is perforated and has a slot cut to form the catchplate; the edge of the catchplate has been bent outwards. The other lug is H-shaped and formed the pin lug. There is some iron corrosion from the pin on the reverse. Now corroded to a purplish brown. 29 mm diameter. 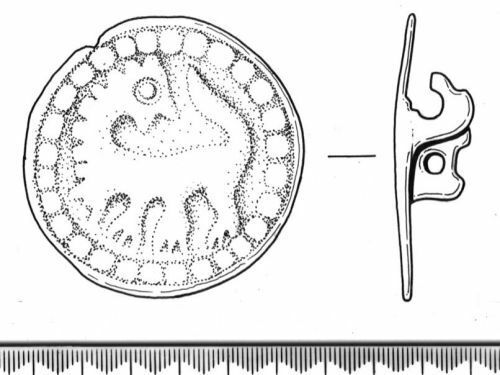 A similar backward-looking animal brooch found in an early 10th-century context in 16-22 Coppergate, York, gives the best date for the series (Roesdahl 1981: 75, 105). The drawing may be slightly inaccurate, especially in the number of pellets shown in the border. This brooch has been included in Weetch 2013, catalogue no. 19.